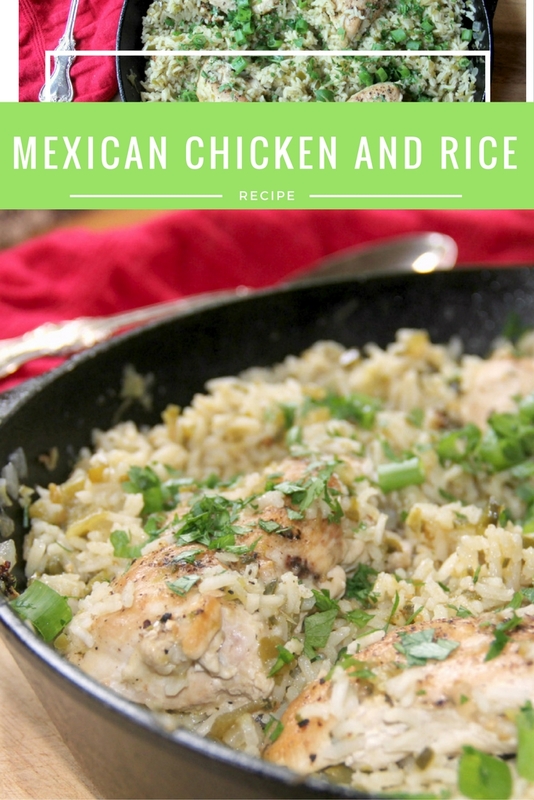 Mexican Chicken and Rice - Fast, Fresh, and Full of Flavor! 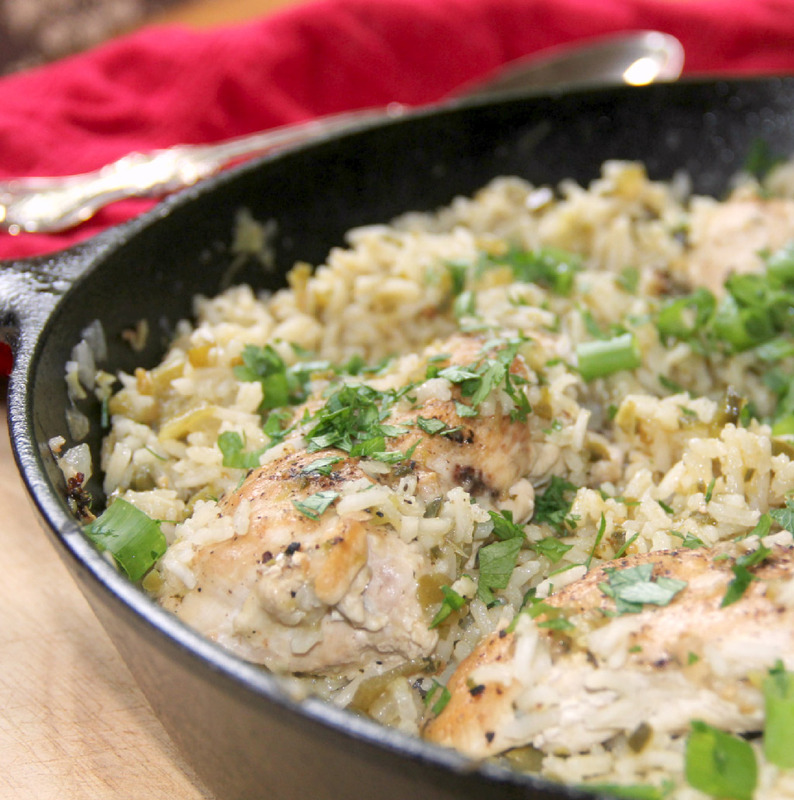 Mexican Chicken and Rice in one pot with green onions and cilantro–it’s a quick and easy weeknight meal! Don’t you love recipes that only mess up one pot? I sure do! 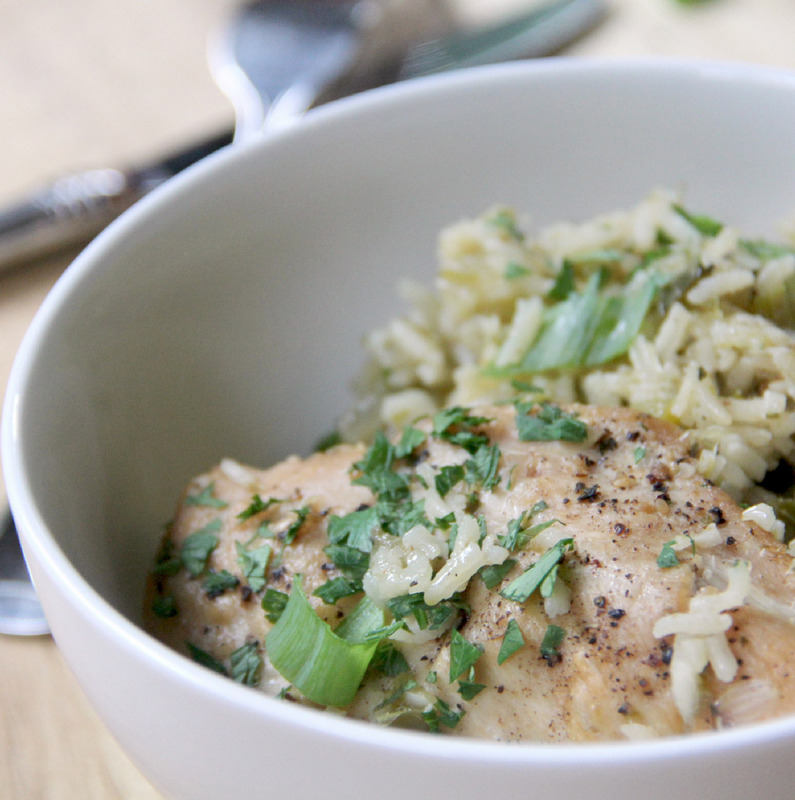 This Mexican Chicken and Rice fits the bill perfectly. One pot and one plate to hold the browned chicken while the rice cooks. That’s it. And the rice is super delicious too! We had this for supper a couple of weeks ago and then ate the rice for two more days. We couldn’t stop eating it! You can easily make this dish on a weeknight or even for company on the weekend. It’s so easy! Brown a couple of chicken breasts then remove to a plate. 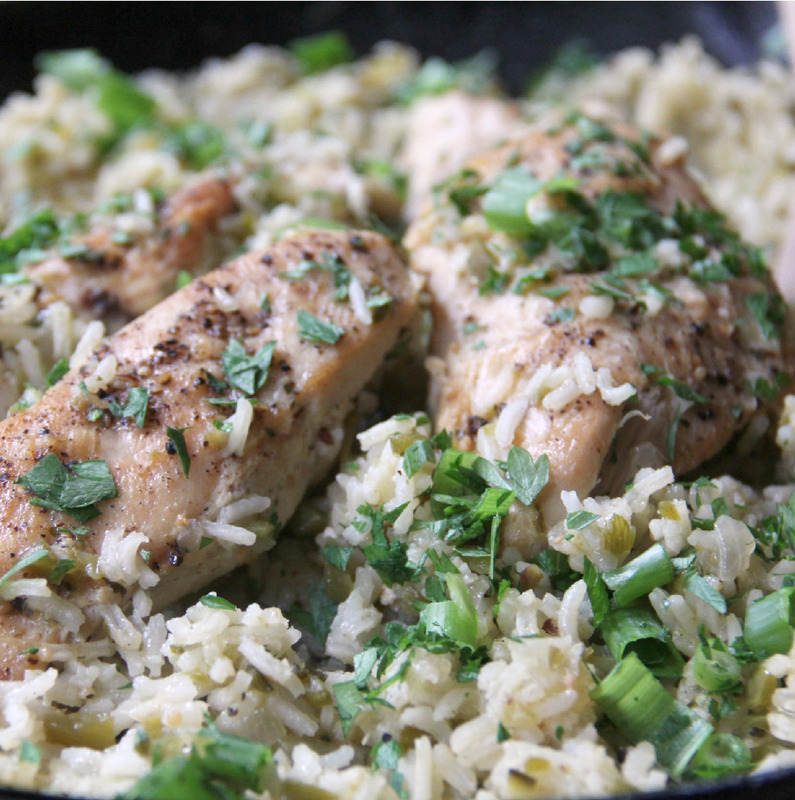 Then using the same skillet, you saute chopped poblano pepper and chopped onion, then add the rice, broth, cumin, green chilis, and jalapeno slices—that’s it! Just place the chicken on top of the rice, cover the skillet, and cook on low for about twenty minutes until the rice is tender. Stir in some fresh cilantro and green onions and you’re done. Simple, easy, and so full of flavor! Add a Mexican slaw or salad or some refried beans and this meal is good enough for company. Recipe adapted from America’s Test Kitchen 30-Minute Suppers. 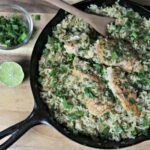 Mexican Chicken and Rice in one pot with green onions, poblano peppers, and cilantro--it's a quick and easy weeknight meal! Season chicken breasts with salt and pepper on both sides. Heat 1 tablespoon oil in 12-inch skillet over medium-high heat until hot. Add chicken and brown on one side, about 5 minutes. Transfer chicken to a plate. Heat remaining tablespoon oil in same skillet. Add onion and poblano and cook until softened, about 5 minutes. Add garlic and cook about thirty seconds. Add cumin, salsa verde, chicken broth, rice, green chilis, and jalapeno slices and stir until well mixed. 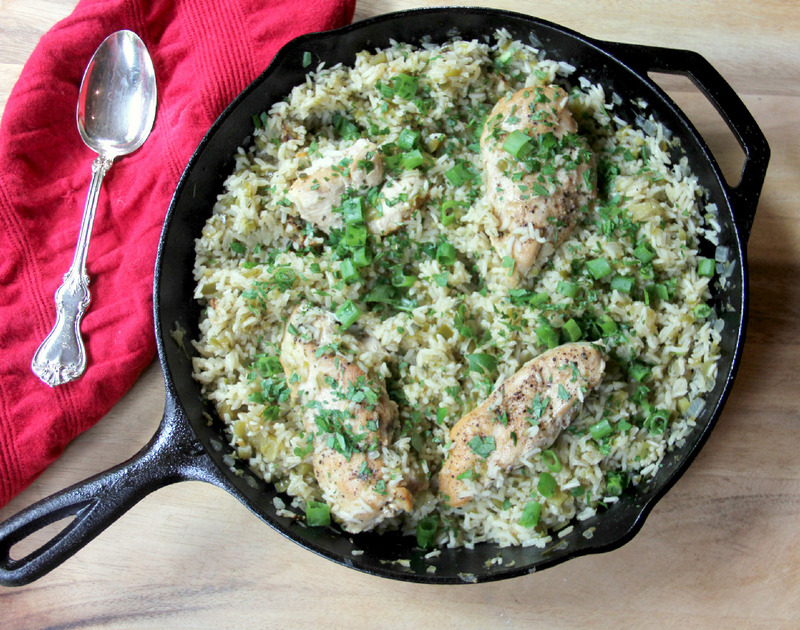 Bring to a boil, scraping up any browned bits of chicken from the bottom of the skillet. Place chicken on top of rice with browned side up and turn heat to low. Cover and cook about twenty minutes, stirring rice frequently to sticking. Stir in cilantro and sprinkle green onions on top. Season with more salt and pepper to taste. Recipe adapted from America's Test Kitchen 30-Minute Suppers.